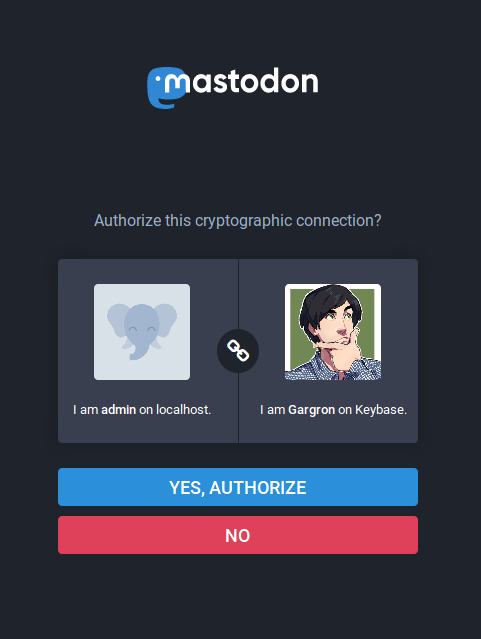 Allow users to setup a cryptographic connection between their Mastodon profile and their Keybase profile. Keybase is extracted into a polymorphous ProofProvider interface to potentially allow other providers to be supported and minimize "hardcoding" a specific provider. Only encode query params if they exist. URLs without params had a trailing `?`. Looks like this could benefit from being an ActiveModel::Model? The refresh! do not seem to be synchronous (it spawns a worker? ), but I question the need to trigger a refresh each time that page is visited. the main reason i had to do this was that there's nothing currently built on the mastodon side to recognize remotely revoked proofs. i thought it might be weird if a user revokes a proof in keybase, then days later still sees it as live in mastodon until the first refresh. we had it as a note to talk about / build something that might let keybase inform mastodon a proof is revoked, or build a rake task for mastodon to check and invalidate revoked proofs. i'm flexible on this though. if you want to change it to be async, i think that's reasonable. This review doesn't really cover the correctness of the implementation wrt. keybase's protocol itself, as I have not read it, but only code quality and some concerns. It seems fine overall, but I'm a bit concerned with the various HTTP calls, some of which synchronous. This shouldn't be a major issue, but still. Also, will this work for any instance, or do instance admins still need to get approved by keybase? Should ActiveRecord validation really have side-effects? I have updated witches.live to the master branch which has support for this, do you need any help testing it, and if so how could I go about doing that? Is there any documentation on how to use this as a user? I can't seem to find it. @cnf It is not live on Keybase's side yet. 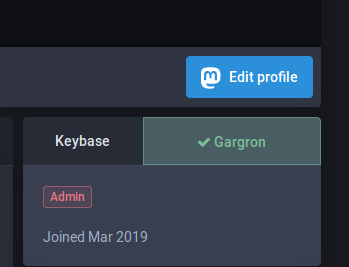 Other than that, there is nothing to do on Mastodon, you initiate the process from Keybase.